My version of basma, with nan bread. 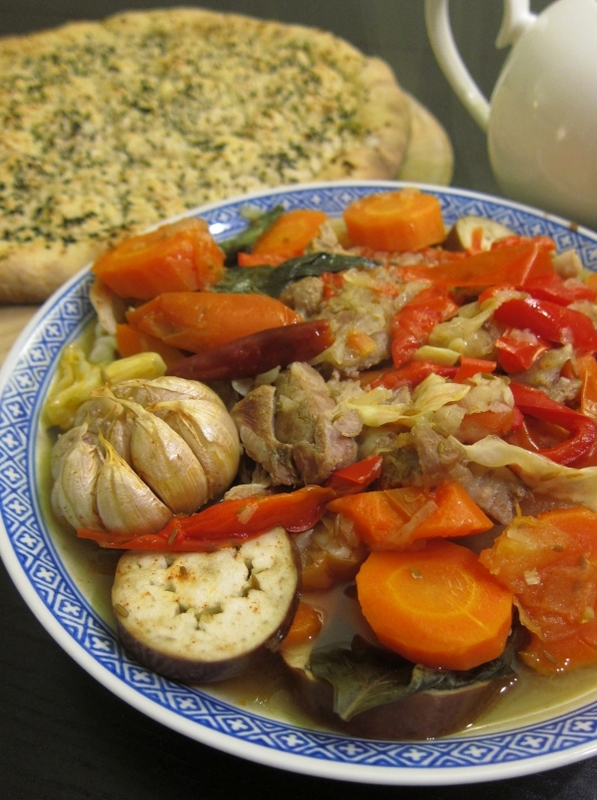 Basma is an incredibly simple dish to prepare with amazing results: tender, juicy, lamb meat that practically melts in your mouth, in a rich vegetable broth with plenty of soft carrots and potatoes. It’s crowned with a few heads of garlic cooked whole: the garlic cloves fall right out of the skin and are so soft they’re almost like a puree. And yet this dish requires nothing more than 1) cutting vegetables and 2) time. 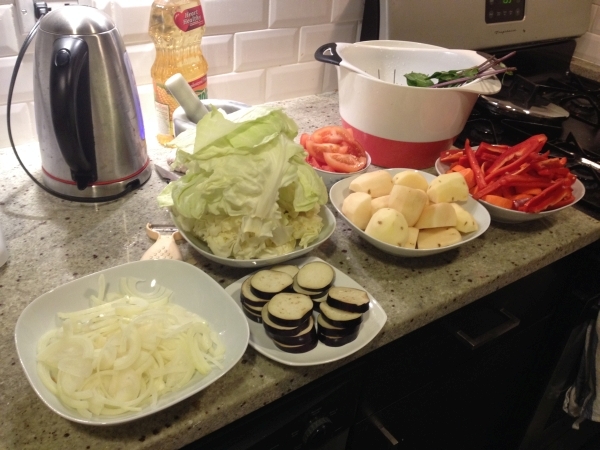 To be sure, it involves a lot of vegetable cutting. And it takes almost 2 hours to cook after the prep is done. But the result is well worth it. 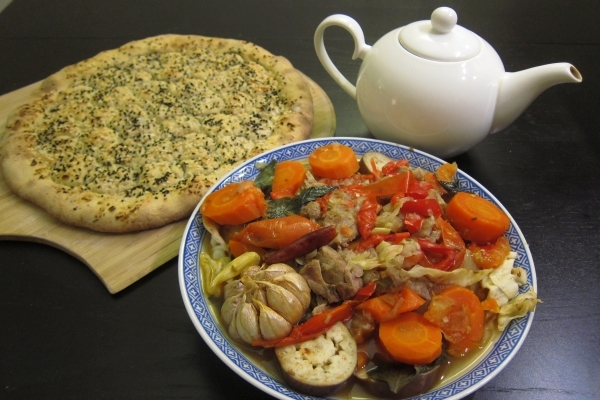 Nan bread is great for soaking up the dimlama broth. Recipe here. 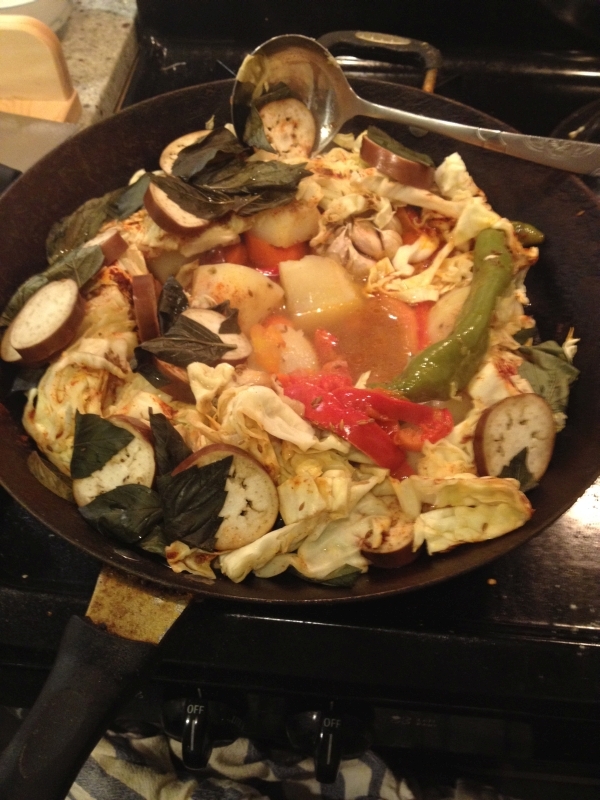 This dish comes from Uzbekistan and goes by a few different names: basma and dimlama/dumlama. According to Stalic, basma refers to this version, where everything is put into a cold kazan and then steamed, while dimlama refers to a similar dish where everything is fried before steaming. This recipe comes from Stalic Khankishiev with some minor alterations (video here). 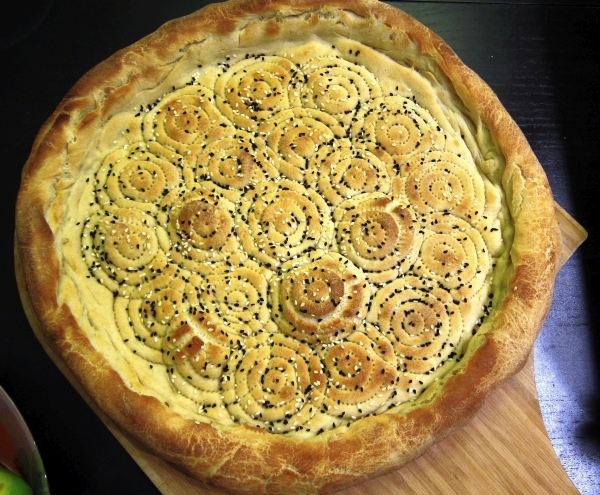 Abdulaziz Salavat has a video recipe for basma (he calls it dimlama) as well. Lamb – I used 2 lbs of lamb shoulder chops in the pictures. The cooking time will depend on how tender your meat is. 1. 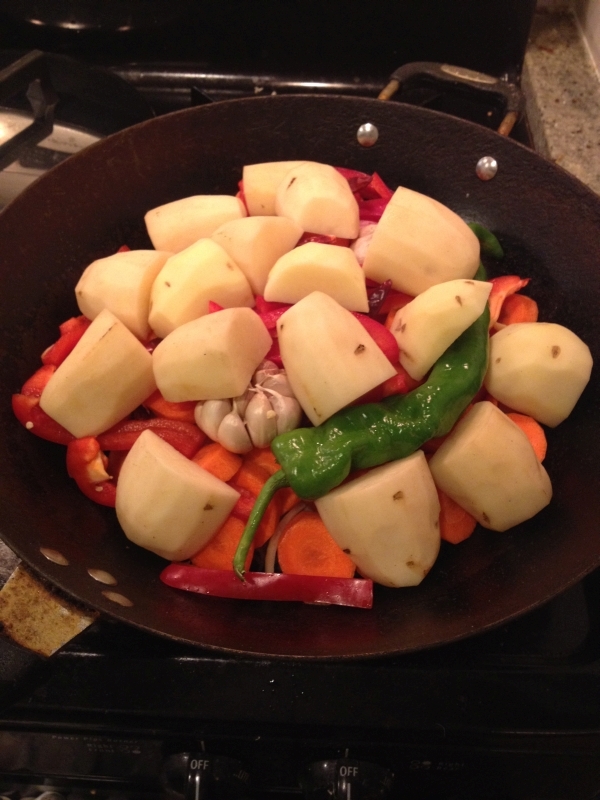 Chop all the vegetables: cut the potatoes into halves or quarters; slice the onions thinly; cut the carrots into discs; cut the bell pepper into slices; cut the tomato into quarters; peel off several whole leaves from the cabbage and set aside, then chop the cabbage into thick slices; chop the eggplant. Cut the lamb into medium/large pieces, making sure to leave some fat on the meat. Roughly grind the cumin seeds. 2. Through the entire layering process, the heat is turned off. 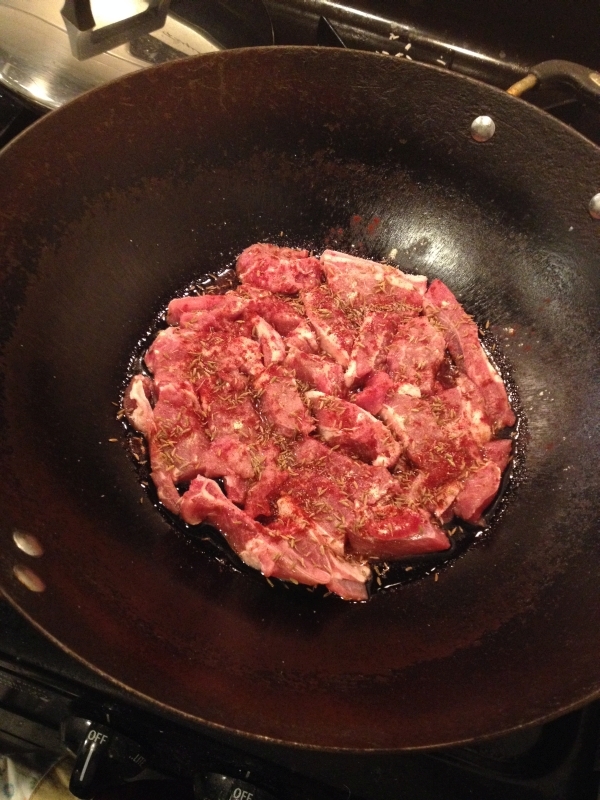 Pour some oil to cover the bottom of the wok, then place the meat in. Make sure the meat is sitting in oil and not directly on the metal surface. Put salt, cumin seed, white pepper, and paprika on the meat. 3. 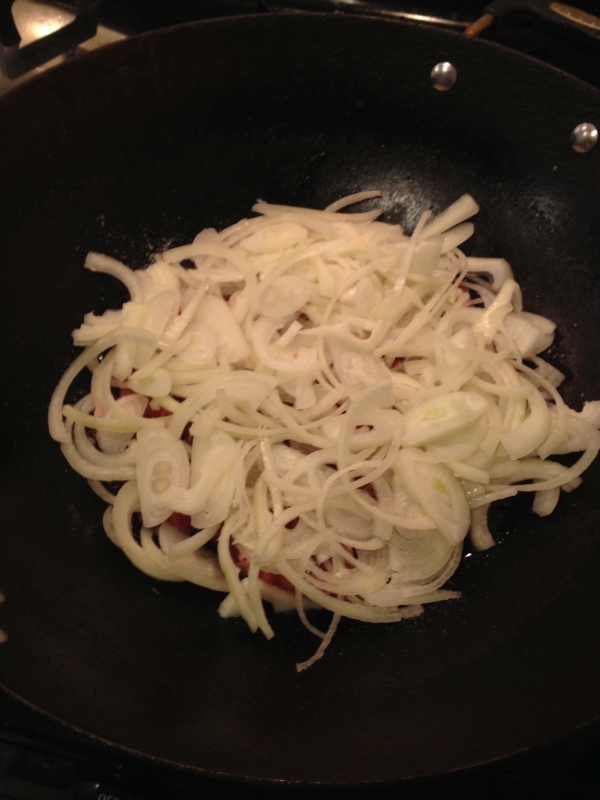 Scatter the onions all over the top of the meat to make another layer. Salt the onions. 4. 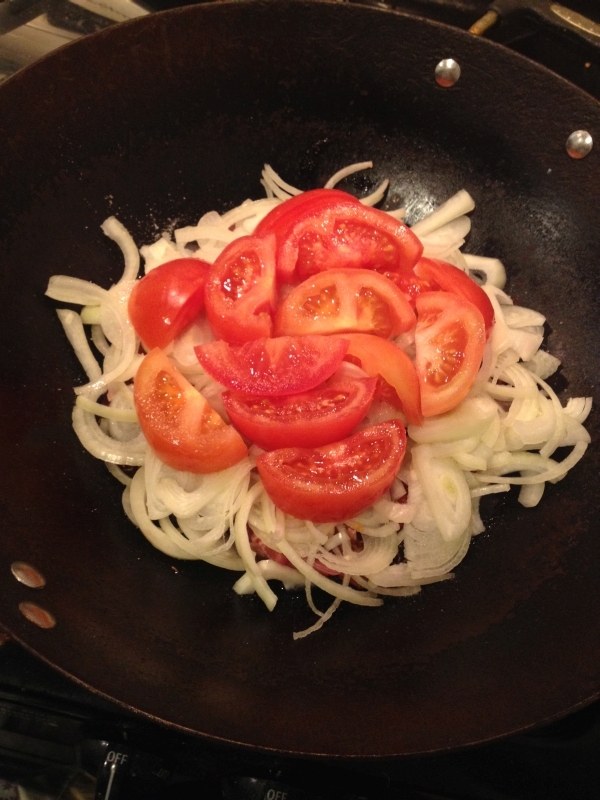 Put the tomato pieces on top of the onions. 5. Put the carrot slices on top of the tomatoes, then the bell pepper slices. 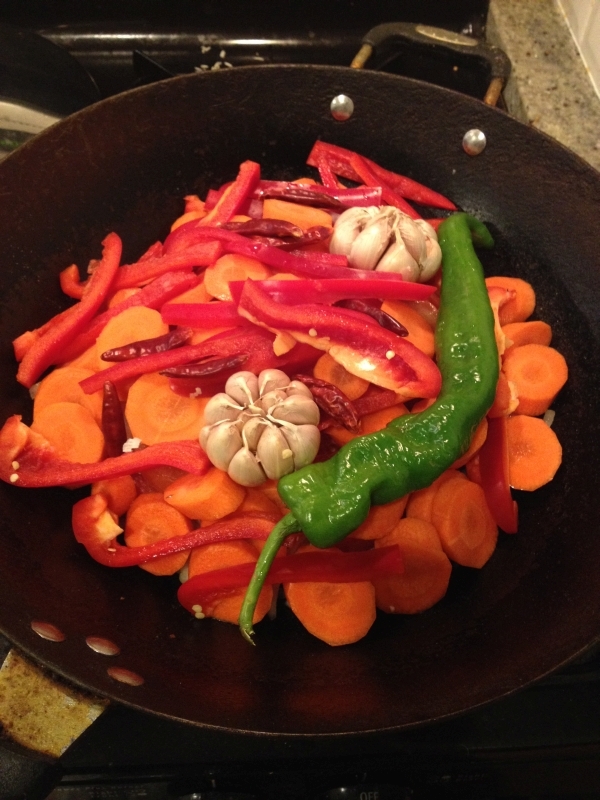 Put the whole fresh chili pepper and some dried chili peppers. Place the heads of garlic, digging them in a bit so they don’t fall off the pile. 6. Place the potato pieces on top. 7. 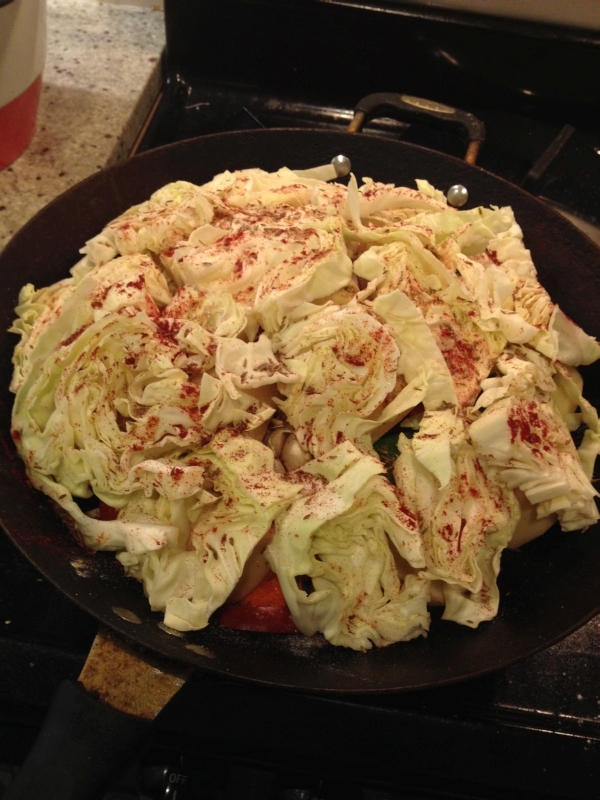 Place the chopped cabbage pieces on top of the potatoes, and repeat the seasoning from step 2: salt, cumin seeds, white pepper, and paprika. 8. 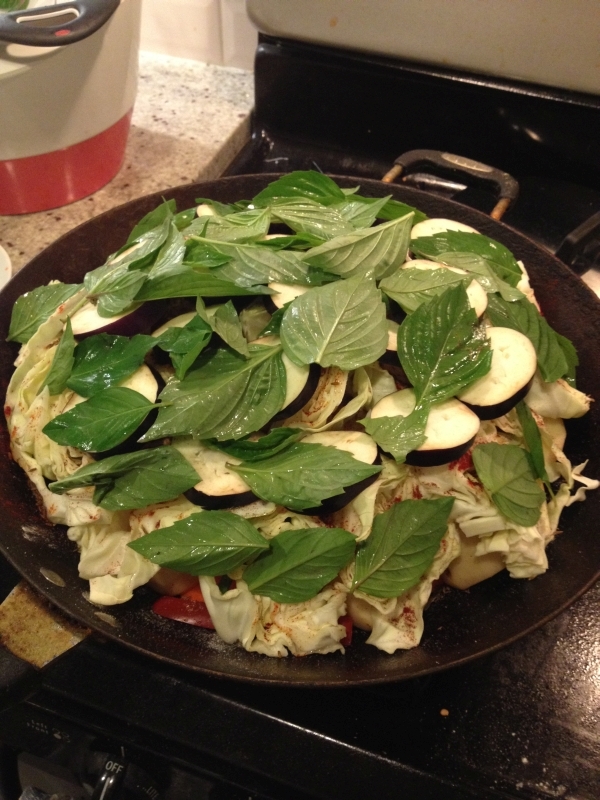 Put the eggplant and basil leaves at the very top. 9. 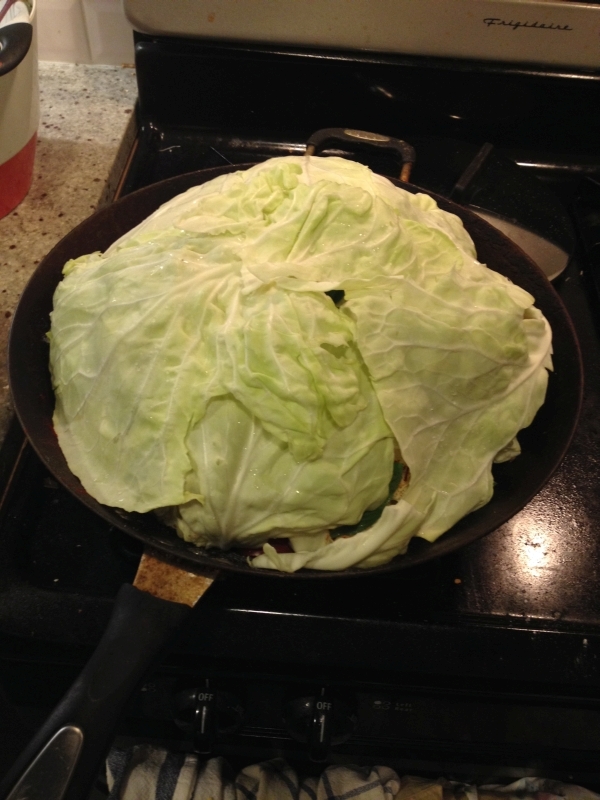 Using the whole cabbage leaves you set aside, make a dome over everything. This will help keep the steam in. 10. 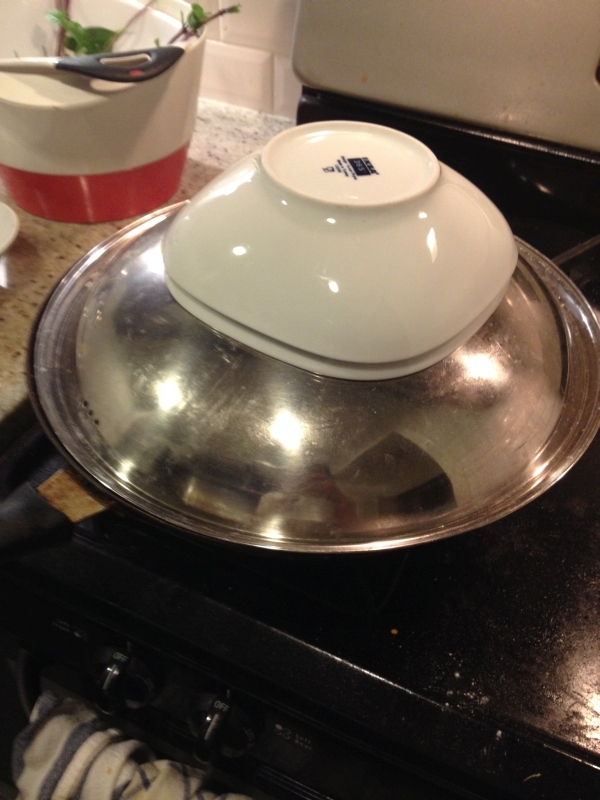 Cover with a lid. If it doesn’t quite fit, weigh the lid down to make sure it is sealed tight. Now the magic begins! Turn the heat up to medium and let it cook for 15 minutes. Then turn the heat to low and let it simmer for at least 1 hour and 30 minutes, longer if you are using tougher meat. Be careful not to turn the heat so low that it stops simmering. When you put your ear to the pot, you should hear a steady bubbling. After the long wait, when we open the dome and break through the outer layers, we find the inside has turned into a vegetable broth! Plate everything and serve with some bread and hot green tea. Osh bolsin!